Learn how to make a sock monkey toy and other cool sock animals by hand with these free printable, easy to follow patterns and step by step instructions. Find where to buy red heel socks, sock monkey, sock creature and sock cat kits, also cool sock puppet kits. Great books are available to learn how to make a sock monkey and lots of other sock animals and sock dolls. The books are so informative with instructions and diagrams or photos that are easy to understand and follow. I'd definitely recommend getting a book to anyone who wants to get creative with their socks! The original vintage pattern creates a monkey with a longer tail and narrower arms compared to the modern monkey pattern. 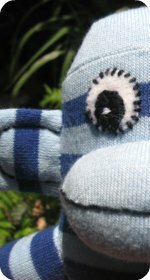 How to make sock elephant toys, with easy to follow patterns and directions. For vintage looking elephants use Original Rockford red heel socks. Peejay sock monkey kits, sock animals kits, sock monkey boys and girls. Sock cat, sock creature and a fancy pink and white sparkle sock monkey kit. 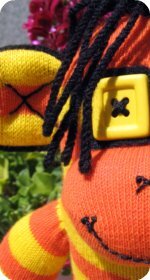 Learn how to make sock puppets for kids with a cool selection of fun puppet kits with all the bits you need included in the packs. 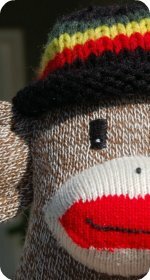 Make original looking sock monkeys with Rockford Red Heel Socks. There are no other replacements, you need the real Fox River socks to get the vintage look. The directions on how to make a sock monkey can easily be altered, so you can custom design your own sock toy in whatever ways you'd like. 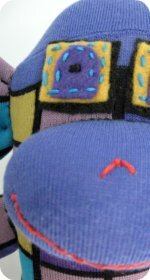 If you think of the patterns as a general guide on how to make basic sock animal toys, the fun begins when you start to add your own personal touches. 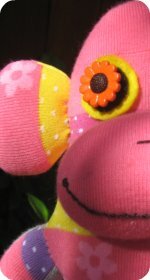 For creative ideas check out the monkey profile pages they give you individual details on how each sock toy we display on our site was customized. Fun tips and ideas are at the bottom of each profile page! 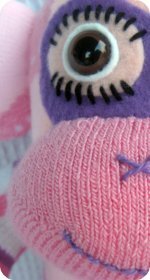 If you want a truly handmade sock doll, you can certainly make your animals without a sewing machine and stitch them together by hand (it would just take a few hours). The size of your sock animal will depend on the size of the socks you use. Bearing in mind it's just as much work crafting a mini sock creature as a big one. I find it easier working with large socks than small ones but mini monkeys sure are cute. If you plan to make classic looking monkey dolls or elephants, you'll be needing Original Rockford Red Heel Socks made by Fox River Mills. A sock doll really is a wonderful gift to craft and they last for years and years.